The Peterborough Panthers rider line-up for 2016. (Back row, left to right) Tom Stokes, Ulrich Ostergaard, Simon Lambert, Nikolaj Busk Jakobsen. (Front) Emil Grondal, Michael Palm Toft, Nicklas Porsing, Tom Perry. Peterborough Panthers intend to put smiles on faces in 2016. That was the message from promoter Ged Rathbone - the reigning Peterborough Telegraph Sports Personality of the Year - when the city outfit was officially unveiled earlier today (March 11). Peterborough Panthers promoter Ged Rathbone. Panthers staged their Press & Practice Day at the East of England Showground with their team - Ulrich Ostergaard, Nikolaj Busk Jakobsen, Nicklas Porsing, Michael Palm Toft, Simon Lambert, Emil Grondal and Tom Perry - all getting vital time on the Alwalton track. “We’re here to have fun, we’re here to entertain and we’re here to be successful,” said Rathbone. “We’ve put together a really exciting team and I wouldn’t want to swap it for any other in the Premier League. “It was great to see the guys on track for the first time today and the atmosphere is already excellent. The build-up to the campaign continues with a social event at the Post Office Club in Bourges Boulevard tonight (7.30pm). The curtain goes up on the new campaign for real on Sunday (March 13) when skipper Ulrich Ostergaard stages his testimonial meeting at the Showground (2pm). Ostergaard is also in action tomorrow (March 12) along with team-mate Emil Grondal. They feature in the Ben Fund Bonanza at King’s Lynn. 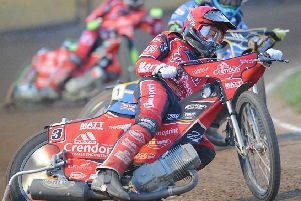 Panthers’ don’t roar into competitive action until Easter Monday (March 28) when they entertain East Anglian rival Ipswich Witches in the first of their League Cup outings.